St Patrick’s Loft is located along Saint Patrick’s Road, near East Coast Road, Katong and Marine Parade Road. 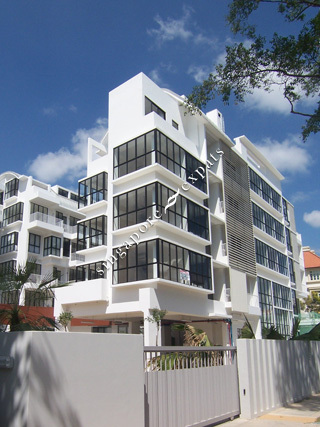 The development comprises three 5-storey blocks of 37 exclusive units of 2, 3 and 4-bedroom apartments. Out of the 37 units, there are 19 unique 2-storey duplex apartments. St Patrick’s Loft offers facilities like a swimming pool, gymnasium and a children’s playground. St Patrick’s Loft is within close proximity to the Telok Kurau Park and the Siglap Park Connector which are the outdoor recreation destination of choice for residents in the surrounding housing estates. St Patrick’s Loft is near to a number of good schools including Tao Nan School, CHIJ Katong Primary, Ngee Ann Primary, St Patrick’s Secondary, CHIJ Katong Convent Secondary and Victoria Junoir College. St Patrick’s Loft is accessible via the nearby Pan Island Expressway (PIE) and the East Coast Parkway (ECP). Travelling to the city and the airport is convenient and easy.